Can you tell me what time our bin will be delivered? It is difficult for us to provide an exact delivery time. Delivery depends on a number of factors, including how many other deliveries we have on the day and when we will be in your area. If you need a skip bin for an early morning start, it is best to have the bin delivered the day before use. What can’t I put in the bins? No bin is to contain any asbestos (except asbestos bins), car tyres, car batteries (car batteries can be placed next to the bin and we will take them away for you), liquid waste such as petrol, oil, chemicals, or any sort of hazardous material. Further details can be found on the Bin Sizes and Prices page. 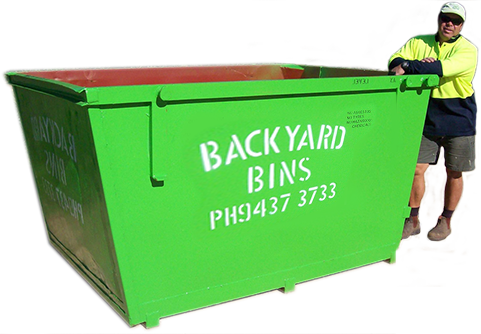 Please see the Bin Sizes and Prices page for details on what types of waste can go in each type of bin. Payment is required on or before the delivery day of the skip bin. We accept payment by cash, Visa or MasterCard (a 1.29% credit card surcharge applies), or EFT. Unfortunately, we cannot accept payment by cheque. Note: Please use your name as the reference. EFT payments must be received in our account prior to delivery of the skip bin. Alternatively, a copy of the bank transfer receipt sent to us via email can be accepted as proof of payment prior to delivery. Can you put bins at a rear access house? Yes, as long as we have a driveway of at least three metres in width and we can back straight down. Can I request a particular location for placement of the bin? Yes, as long as we have good access with no overhanging tree branches, house eaves or low power lines that could hinder delivery. Our expert drivers can assess location on the day of delivery. Are your trucks rear loading or side loading? All of our skip bins are loaded off the back of the truck. We need to reverse into the location that the bin is to be placed.